Hong Kong's glistening skyline is home to many booming industries, earning the city a reputation as a hub of free trade and opportunity. But in reality, the city of 7.2 million is dominated by a handful of tycoons that control everything from supermarkets to real estate. Take Asia's richest man, Li Ka-shing, 86, with an estimated net worth of $33 billion. Li controls vast tracts of property, and owns some of the city's biggest supermarket chains, telecoms, major ports and shipping firms, and even energy and utilities companies. 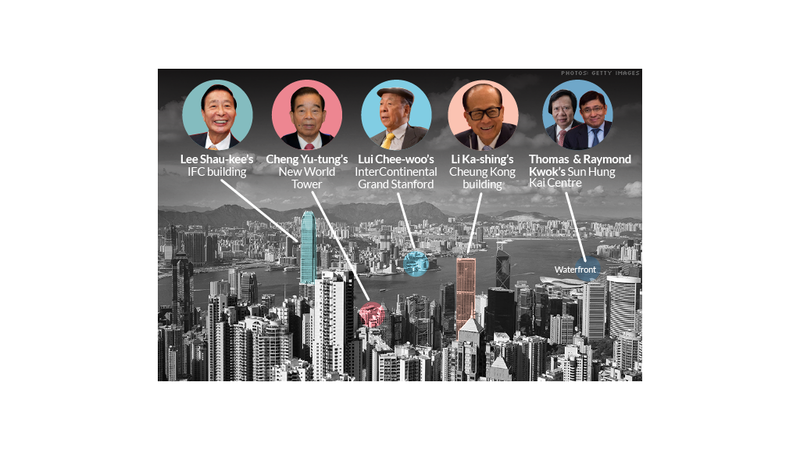 Other tycoons such as Lui Che-woo, 85, and Cheng Yu-tung, 89, also dominate a variety of industries -- construction, casinos, luxury retail, infrastructure, and local transport, from buses to ferries. Nearly every expense in a Hong Konger's daily life -- picking up groceries, turning on the lights or riding a bus -- ends up lining the pockets of these tycoons. While they were once revered for their rags to riches success stories, the political and economic influence wielded by the tycoons is now a flashpoint in the ongoing pro-democracy protests that have swept Hong Kong. On the streets, there is little love for the 1%, who many blame for sky-high home prices and the widening wealth gap. "Hong Kong is one of the most unequal societies in the world," said Willy Lam, a professor at the Chinese University of Hong Kong. "Apart from the political motivation -- pursuit of real Western-style elections -- the students are also venting their frustration at the income inequality ... and less opportunities for upward mobility for a college graduate." Tycoons are seen as making these issues worse with their grip on industry. "The dozen or so tycoons at the top are seen as having monopolistic power in the market," Lam said. "Competition is really not free in Hong Kong -- there is a lack of a [level] playing field." Without any antitrust laws in Hong Kong, many of these multi-billionaire tycoons are believed to game the system in their favor. The lack of competition is perhaps most evident in the city's real estate sector, where three companies account for 72% of the residential property market, according to CLSA. Home prices have doubled over the last decade, while wage growth has largely remained stagnant. Adding to frustration is a seeming lack of interest in reform by city leaders, many of whom are influenced by pro-business interests. As it stands, the business sector controls roughly 700 votes of a 1,200-member electoral committee in charge of selecting Hong Kong's city leader, called the chief executive, said Ma Ngok, a professor at the Chinese University of Hong Kong. Mainland China prefers to keep it this way -- the central government can exert influence on Hong Kong through the tycoons, because they all have multi-billion dollar investments in China to protect, Ma said. 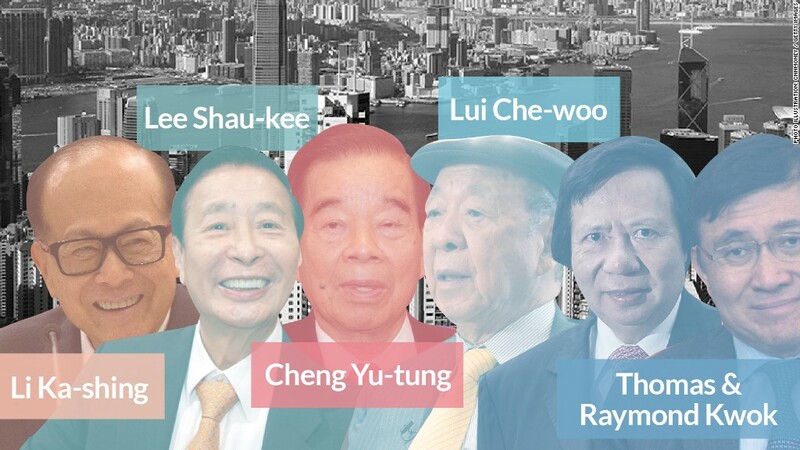 The clock is ticking on how things are run in Hong Kong -- many of the richest tycoons are now in their 80s, and how their successors operate could change circumstances. But for now, they will remain "part of the fabric of Hong Kong culture," said Ben Cavender of China Market Research. "You can't ignore them, because they're always there -- in the news, or you're dealing with one of their brands."